On the 9th, the regiment moved back to Armoises and the next day to Sommanthe, and then on to Verpel on the 11th. It was here at 4:00 that the troops heard of the Armistice. Postcard front the above message was writtn on. Received your letter of Nov 14th yesterday and will try to answer it. I haven't got the box yet but expect it any time now. We have been in Germany since the 3rd of Dec and reached the Rhine the 15th. I am on detail with the supply company now as they were short of men. I don't know how long it will last but it suits me allright. It seems natural to be working around mules again and you don't have to walk either or carry a pack. We were stationed right on the bank of the Rhine but yesterday we moved back about 2 kilometers. It is not such a big stream here The town's name on the Rhine is Oberwinter. It is quite a good sized town for this country. This country is awful hilly through here. The hills are terraced and farmed to the very tops. every in of space is used. Planted mostly in grape vines. The towns and people in Germany are mutch (sic) cleaner and better taken care of then they are in France. The people treat us better too. they want to be awful good to us. They are just as glad the war is finished as we are. They surely had a tough time under the Kaiser's rule. They had to buy their own stuff from the Government and pay out everthing they make for taxes. One man told us they paid 8 marks a pound for their own butter that they made. A mark used to be worth about a quarter but German money has dropped a great deal in value now. Well I guess this is about all for this time. Click the photo for much higher resolution version. This is presumably Co. D, 166th Inf, 42 Div at Unkelbach, Germany in January, 1919 at Schloss Enich - the " big summer hotel on the bank of the Rhine river," that Grandpa wrote about in his letter. Officers in the center are Lts, Todd, Crotinger & Maxwell from left to right. I've not been able to identify him in the photo, perhaps because he was now assigned to the supply co.
Got the box yesterday. It came just right to be an Xmas present. Everything was just what I wanted too. The chocolate sure tasted good. I got letters from the rest of them too but they were old ones that had been written in October. I don't think we will be here mutch (sic) longer. The officers all say this division is going home right away but you can't most always sometimes tell you know. It snowed Christmas Eve here so we had a white Xmas too but it not (sic) very cold this morning. Well, I guess this is all for this time. I am now stationed at Rolanseck, Ger. with Co.D. 166 Inf. and am alright, only a touch of rheumatism. Co. D. 166 Inf. Amer. E.F.
Mar. 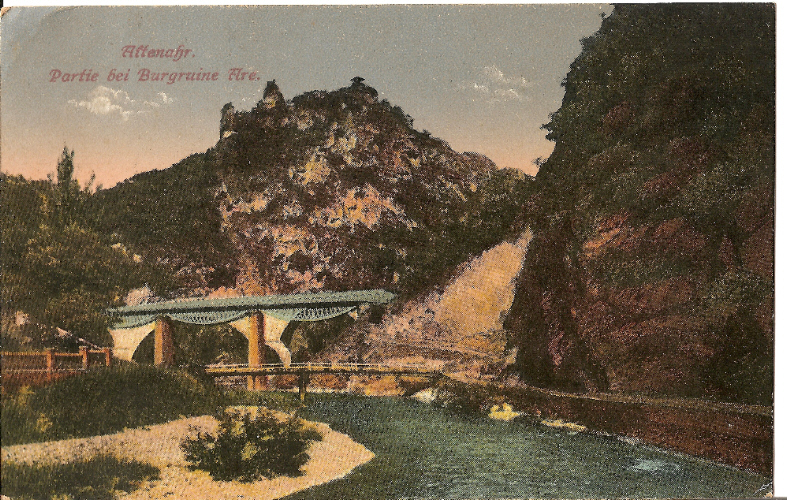 3, 1919, Rolenseck, Ger. Will drop you a few lines to let you know that we leave here the 7th of April for a French port to sail so will probably be in the states by my birthday. I hope so anyway. There is nothing doing here only getting ready to leave. Are you getting that money regularly? I will need some when we hit the states. I haven't got any mail for a long time. Did you get the pictures I sent you yet? Well I guess this is about all for this time. his is my last letter from here I guess. Was in the hospital 13 days with barber's itch but am all right now. Passed our final physical examination yesterday. Will probably be at home by the last of May. Well good bye for this time. On April 7, the first Battalion boarded troop trains and after 3 days and nights, they arrived at Brest. A week of delousing cleaning up, and issuing of new equipment (that's the army for you), made them ready to board the Levithan on April 15th and head back home. He was discharged from the army in 1919 at Fort Sherman near Columbus, Ohio. Company D lost 16 men killed in action, or died of wounds, and 112 were wounded in action. Four members won the distinguished service Cros, and four, the French Croix de Guerre.